Michel Blavet, flautist and composer, was baptized on March 13, 1700 in Besançon, France and died on October 28, 1768 in Paris, France. He was self taught on Bassoon and Flute, and moved to Paris in 1723. By the late 1730’s, his renown as a musician was unrivaled. 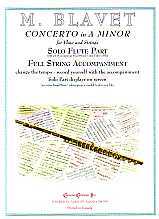 He wrote several Flute Sonatas but the Concerto in A Minor (ca. 1740) is his only surviving Flute Concerto (he undoubtedly wrote several). Violinist Jean-Marie Leclair (1697-1764) probably composed his 9 Flute Sonatas and Flute Concerto for Blavet.